"You never see positive images of young scientists on TV, just pop stars or actors." "Science lessons should be practical and fun." Write an essay discussing two of the points in your notes. You should explain which way would be more effective in encouraging young people to study sciencie, provinding reasons to support your opinion. You might, if you wish, make use the opinions expressed in the discussion, but you should use your own words as far as possible. It is often claimed that education is the single most important factor in the development of a country. 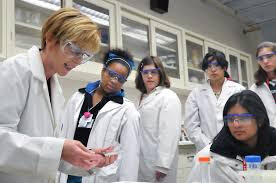 Nonetheless, official statistics show that the number of students pursuing a degree program related to a science field has dramatically declined. Not only does it seem to be decreasing scientific research, but also the country’s financial development. One of the main causes of this problem is the government’s lack of Financial Support to educational institutions. It appears to be the case nowadays, that the State is unwilling to provide university grants and scholarships. Fifty years ago it was a different story, there were many options for middle-class people to access decent education; on the contrary, in the current scenario, with life being so expensive and unaffordable, young people prefer to get a job rather than going to university. And those who do go to university are inclined to study other areas which they find more appealing. It goes without saying that advertising plays a crucial role in people. Currently, all publicity campaigns seem to be focused on the pop-stars way of life. Consequently, young people feel more interested in becoming actors, musicians or reality show producers. However, who is it to blame? That is an interesting question. Most experts agree that the burden of responsibility lies in the hands of the government, since they are supposed to provide assistance with promoting science. Therefore, I am of the opinion that the time is ripe for the political authorities to implement a grand program and financial support to talented teenagers with limited resources. This is, as I see it, the best way to promote economic growth and sustainable development.